A wet Saturday morning dawned for the May “Saturdays in the Garden” lecture recently. 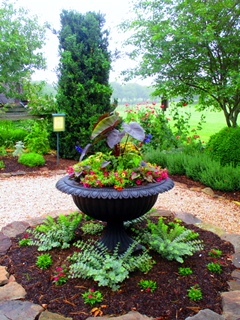 “The Garden” in the lecture title is Loudoun’s Extension Master Gardener Demonstration Garden at Ida Lee Park and Recreation Center. In this space, our volunteer organization to grow both ornamental and vegetable gardens using the most current research-based techniques from Virginia’s land grant universities: Virginia Tech and Virginia State University. 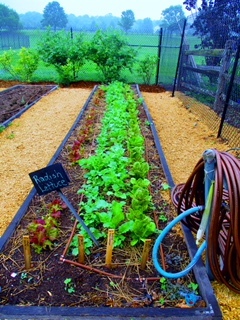 As I completed the Garden To Table Team lecture about vegetable garden transitions from spring to summer, I noticed a small group of formally dressed adults making their way to the Demonstration Garden from the parking lot despite the rain and chill. I pondered the “why” as I watched them stop several times and talk quietly while meandering down the newly mulched pathways of the garden. Unable to restrain my curiosity, I approached and asked a light-hearted question to understand why they were in the garden on such a day. A middle-aged gentleman explained in low tones that he and his family had just come from a funeral service in Union Cemetery adjacent to Ida Lee. He then went on to say that they were at there in remembrance of his wife who adored the Demonstration Garden. It was a place they had visited many times together and both were inspired by its beauty. Once he realized he was talking with some of the caretakers of the garden, he then added that he chose a burial plot on a small rise in the cemetery where, beyond the grassy fields and trees, one could view the garden and its beauty from afar. There is no more somber occasion than the death of a wife and mother, however the family appeared to find comfort in the serenity of this place their departed loved one had enjoyed so much. Monthly, the Demonstration Garden requires hundreds of volunteer hours to plant, grow, weed, prune, mulch and harvest all that thrives there. But a significant percentage of Demonstration Garden’s impact on our County’s residents and visitors is never known by those who tend it. While difficult to quantify, those who toil on behalf of the Demonstration Garden may now understand that their efforts are being recognized, enjoyed, utilized and even memorialized, yet only known, through a chance encounter in the garden. 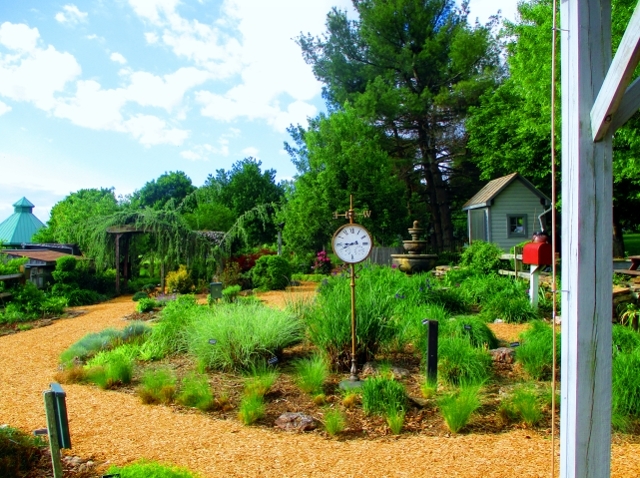 We invite you to visit the Demonstration Garden at Ida Lee Park to experience its beauty. Each year thousands of pounds of fruits and vegetables are harvested and donated weekly to Loudoun Hunger Relief for our residents. The ornamental gardens, while beautiful and home to many pollinators, also are learning labs where latest-research based techniques are demonstrated annually. The Extension Master Gardeners are volunteer educators who work behind the scenes and with our community in various ways. -Story contributed by Denise P., Loudoun County Extension Master Gardener.